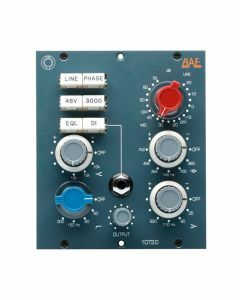 BAE 1073D 500 series EQ / Mic Pre, 3 space wide module for optimal quality in contrast to building a smaller rack space version lacking the same premium components. BAE 1073D works as a Mic Pre, DI and EQ giving the unit a unique array of versatility. The BAE 1073D (Deluxe) is essentially a BAE 1073 module with extra high frequencies and a direct input for the 500 series market. Built using the same exact parts as the 10 series module, the BAE 1073D 500 series EQ / Mic Pre features Carnhill transformers, Elma gold plated switches and Canford wire making this the best sounding Class A mic‐pre EQ module on the block.